Dr Ben Garrod is an evolutionary expert and broadcaster. His new live show for young people, So You Think You Know About Dinosaurs, comes to Dunoon, Oban and Shetland this week. He told Murray Scougall the Honest Truth about his lifelong love of all things prehistoric. Never ask an evolutionary biologist this! I guess it all started about 245 million years ago when a fish-like ancestor of mine climbed out of the muddy pools on specially-adapted fins. The rest was history (well, prehistory)! I grew up on the east coast of the UK, where I spent a lot of time on the beaches with my family. We made up stories about the various bits and bobs we’d find along the shoreline and that set me on my path as a scientist, at about four years old. Now, I’m a Professor of Evolutionary Biology and Science Engagement at the University of East Anglia, but have done degrees in animal behaviour, wild animal biology and the evolution of monkeys. I’m basically a super geek who loves nature and who never grew up. Where have you visited on dinosaur digs? I’ve been lucky enough to see fossils all around the world, from dinosaur footprints in Svalbard in the Arctic to massive eggs from extinct elephant birds in Madagascar. My favourite places for fossils, though, are the UK sites – finding something so close to home always makes me that extra bit intrigued and excited. Travelling to Argentina with Sir David Attenborough to see huge titanosaur bones in Argentina is definitely up there. We were filming for a BBC programme and went to the site where the bones had been found. The femurs (thigh bones) were nearly three metres long and, when alive, the animal would have weighed as much as 14 African elephants and been as tall as a five-storey building. Here I was standing next to the bones of this huge beast. And next to Sir David. I couldn’t believe how lucky I was. What was it like to work with Sir David? He’s a legend. Not because he’s a national treasure but because he’s so passionate about the natural world and is as excitable as a kid when he sees or learns something new. He’s so much fun to work with and really knows his stuff, but is always so keen to talk to people to learn more or to hear their stories. Do we still have a lot to learn about dinosaurs? So, so much. We have barely scratched the surface. Did you know birds are actually dinosaurs? That T Rex very possibly had feathers and that some dino herbivores needed to eat as much as a skipful of leaves every day just to stay alive? Just imagine how much more there is to learn. The cool thing is we’re finding more fossils than ever before and, with better technology, we can learn more. What’s your live show about? I want to take the knowledge and passion which so many young science lovers have about dinosaurs and challenge that to see how much we really know. Is it important to engage people from an early age in this subject? The sooner the better. We start learning while still in the womb so why wait until you’re at school or university to learn about the things you love? 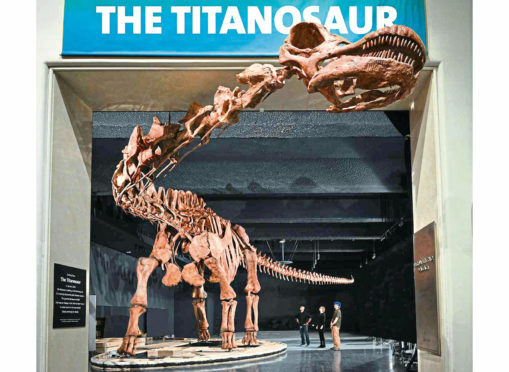 Young science lovers are able to understand quite complicated topics – and if you don’t believe me, challenge a five-year-old to see who knows more about dinosaurs. You’ll be sorry. How does Scotland fare for dinosaur fossils? Scotland is world famous for palaeontology. There are some incredibly old rocks with some insanely old fossils along the west coast and some secret sites where some very cool dino discoveries are being made right now. The great thing is you don’t need to travel to the other side of the world to find amazing fossils, they’re right on your doorstep.